Man there are certainly ups and downs to being a parent. Ethan is such a sweet, smart and BUSY toddler. Since the house is pretty much baby-proofed being home is not too much of a challenge. Taking him to someone else’s house, out to eat can be very stressful. I have to chase him the entire time we’re out and make sure he’s not eating anything poisonous, ripping flowers off people’s plants or stealing toys away from other children. It’s near impossible to hold a conversation with anyone. It’s starting to really stress me out and I need to find a way of dealing with it. The other day Ethan said flower for the first time and he mimics the sound of thank you. He loves playing with balls and still loves to watch sesame street. We have one cupboard for him in the kitchen that I fill full of toys and other goodies. He loves opening the drawers and dumping everything out. I gave him a stacking toy the other day which he really enjoyed. He stacked and re-stacked for a good hour or so. I was really excited 2 nights ago, Ethan put himself to sleep. 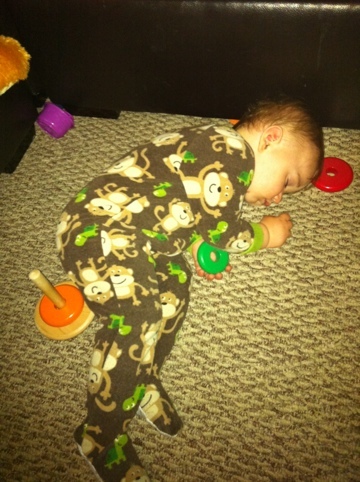 The night before that, he fell asleep while playing! This is night and day from the sleep struggles we have had for the past few months. Ethan met the Easter bunny for the first time yesterday. He enjoyed meeting him for about 2 minutes (and we were able to get a smiley picture:) and then lost it. If I can save anyone from embarrassment, here’s my embarrassing story from the week. Don’t assume a child is a boy just because they are wearing blue and brown. “how old is your son?” “actually it’s my daughter…” oops. A couple of “toddler tips” that have worked really well for my busy child at restaurants: 1st is a balloon and 2nd is a large lemon wedge. Feel free to share your advice, I could use it!